This is a lunchpail tin I decorated a couple of weeks ago - it was ordered by one of the teacher's at Morgan's school. I think it turned out really cute - I wanted to keep it for myself! 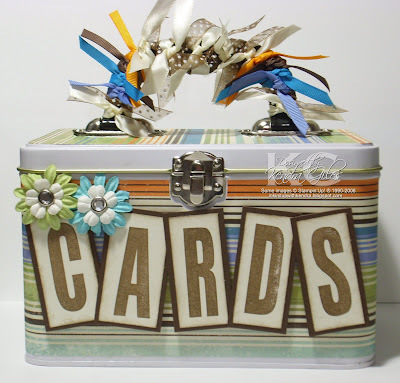 *wink* I filled it with fifteen cards, envies and of course a matching pen. She loved it! 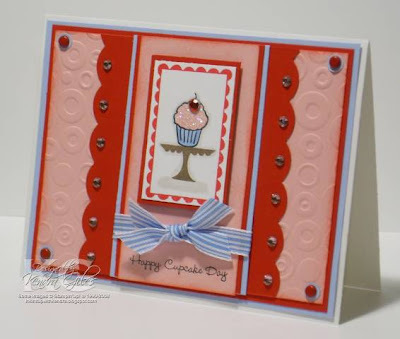 I will be working on several projects over the next few days for some sneak peeks for the My Favorite Things and Hanna Stamps new releases, you won't want to miss these because the newest sets are amazing! We are just a few days away from a brand new year! I will be giving away some blog candy in a few days to celebrate the new year and to celebrate more than 200,000 hits to my blog since I started a little over a year ago!! Keep your eyes peeled! I am going to be changing up my blog and giving it a little facelift! My good friend and fellow design team member, Beth Silaika, made me the most adorable new Blog Banner and I can't wait to show it to you all. Beth will be installing it for me tonight!! Beth did a wonderful job! Thanks Bethie, love ya much! *muah* If you are looking for a new banner or maybe a new watermark for your photos check out Freckled Fun Designs and let Beth create something adorable for ya! This is an Elzybelle card I made a few weeks ago for a card order and for my stamp club and I completely forgot to share it - so here it is. I just love these little girls carrying the tree, it is just sooooo cute! I have so enjoyed working on my christmas cards and was sad to see them go. I just love christmas! Thank you for all your kind words and emails concerning Morgan's surgery - she did well and is starting to recover - she is still having some pain, but we are keeping that under control. She is eating and drinking well - that's a great sign! I hope 2008 is much better for her and her throat infections are down to a minimum! Have a great Christmas and enjoy the time with your family! I will be back in a day or two. I am FINALLY making some christmas things just for myself - well actually for me to give away. I made a few of these to add to my christmas cards that I will be giving out - I made several different christmas cards this year, instead of making them all the same. This has to be my absolute favorite card I have made so far. I wasn't sure about the color combo when I was putting everything together, but once I finished - oh, I was in love! The set is Baby It's Cold Outside by MFT! I used Tulip Puffy Paint for the snow and dazzling diamonds on the snowman, hat and scarf - it's soooo sparkly! I still have a few christmas presents left to purchase and wrap and a few projects to complete. Accessories: Copic Markers, Oval Punches, Photo Corner Punches, Dazzling Diamonds, Dimensionals, Gemstones, SU! Wasabi Stitched Ribbon. 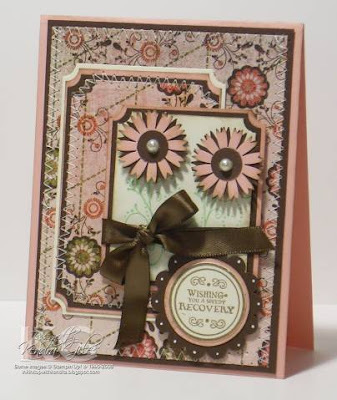 This is the newest release from Hanna Stamps and it is absolutely TDF! Perfect Package - You can use this set year round, not just as a christmas set. This would make great birthday cards! My DD's have so many cute socks so I couldn't resist giving Hanna some polka dot socks! I colored Hanna with my copics and then gave her some sparkle with my Cotton Candy and Xmas Red Stickles. I made a few of these to use for my christmas cards. I am still working on all my christmas gifts and my christmas projects - I'm swamped! I am finally seeing some light at the end of the tunnel in my card orders - I still have yet to finish my own christmas cards, I am hoping to have those completed by the end of this week. I still haven't finished my christmas shopping and we are having our work christmas party tomorrow and I still haven't bought my chinese christmas gift! Oh and did I mention I need groceries?! Accessories: Dazzling Diamonds, Gemstones, Photo Corner Punch, Dimensionals and Stickles. 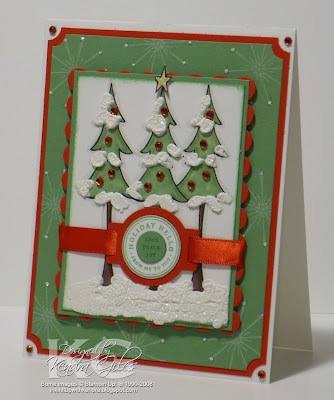 I love this tree from the Tis The Season set from Hanna Stamps. I wanted to make a fairly simple christmas card because I had so many to make and decided to use this tree - this card is gorgeous IRL - I added dazzling diamonds to the tulip puffy paint before I heated it with my heat gun - it's soooo sparkly! I added some red gemstones for ornaments. 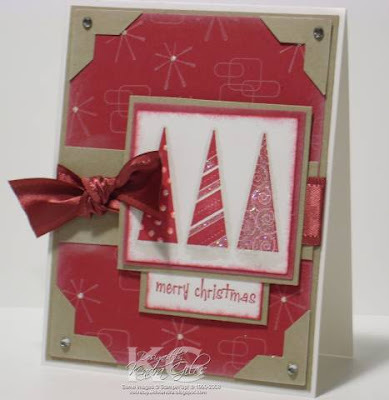 Wild Wasabi and Real Red is a great traditional christmas color combo. 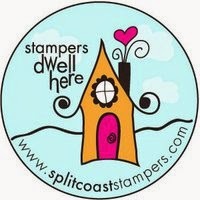 I have stamp club today and made several different projects to share with everybody......we are making peppermint pattie sandwiches with the scallop circle punch, refrigerator pad magnets with jr. legal pads (jr. legal pads cut in 1/2 at my local kinko's) and post it note holders - these all make great handmade christmas gifts. These ideas are all a mixture of several items I have seen on SCS. 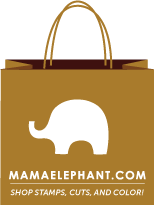 The Ornament gift cards are soooo cute - see Sharon Johnson's blog - hers are amazing! I got my idea for the post-it note holders from my very talented blogging friend Angie Juda - this girl has some great SU! stuff let me tell ya! These holders are made with square coasters. It is sooooo cold here today - we are in a winter storm warning and we are supposed to be having freezing rain later today - this is great stamping weather! I am sooooo glad it's Friday! My work week (job that supports my stamping habit) is about to end and I can relax and get to work getting my projects completed! I still have so many to get finished.............my stamp room is in a complete disarray!!! Wait, let me rephrase that - my stamp room is a complete mess and looks like a bomb exploded! It is so awful I can't even begin my next project, which means I will have to clean first and then start the process all over again! lol I can't find anything and I can barely move - there's just stuff everywhere! I am definitely not a neat stamper. This card was for another order that I completed - the sentiment is from the Verve Visual set Wonderful Wishes, the punch is from Martha Stewart and the DP is Basic Grey. I'll be back tomorrow with another project post! I worked (played) so hard this weekend and got so many orders filled it was just amazing! No, I am not finished yet, I still have several more to go! Yep, I gave in to the Elzybelle craze a couple of weeks ago and purchased these cute little girls carrying a tree - aren't they just adorable? They remind me of my girls. The color combo kind of just evolved and after I got it all put together, I thought WOW! I used Soft Sky, Always Artichoke and Certainly Celery - those colors are just amazing together. 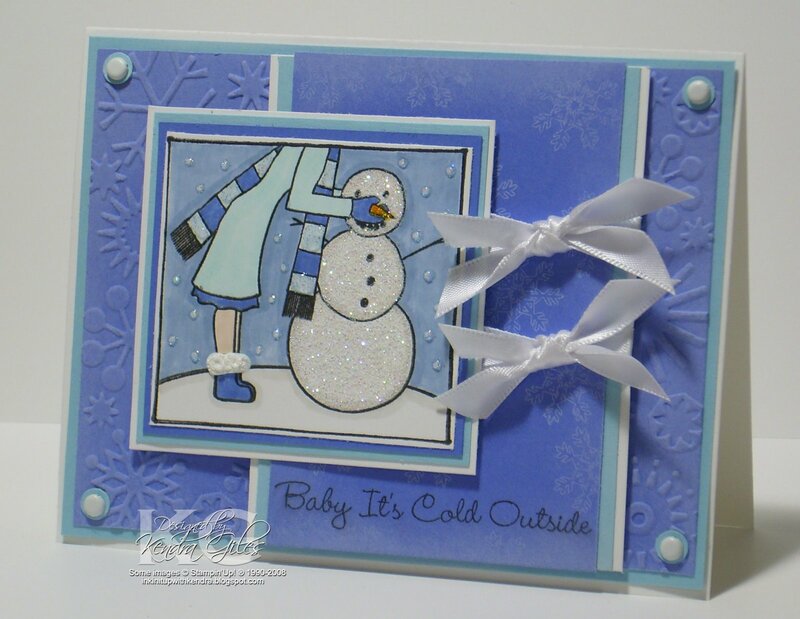 The background snowflake stamps and sentiment are from Verve Visual and they rock - you can find Winter Wishes here. Julee is super sweet, has fast shipping and her prices are great. 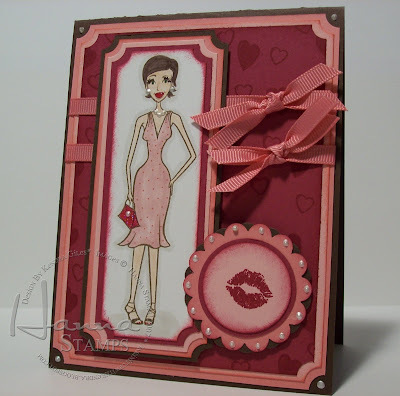 I couldn't resist and pulled out my Janome Sew Mini and did some stitching around the edges of the card. I am gonna make a few more of these for myself for my personal christmas cards. I have much more to share through the week so stay tuned! I have tons more stamping to do, christmas gifts to make and christmas party invites to finish. I'll be back with more pics soon!